Darwin's frog (Rhinoderma darwinii), so named because Charles Darwin discovered it during his famous trip on the HMS Beagle, is one of the most remarkable animal fathers I have ever heard of. Living near slow moving forest streams in Chile and Argentina, this inch long frog normally lives a very low key life. 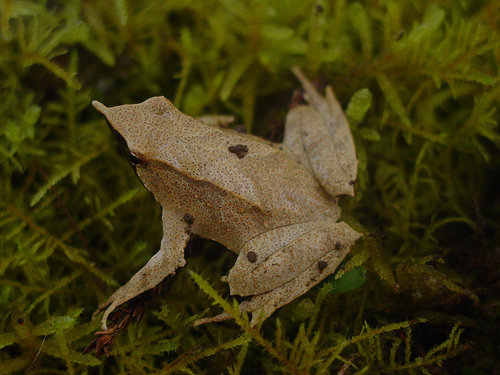 Camouflaged to look like a leaf on the forest floor, it generally escapes notice. During breeding season, however, it is hard not to notice this strange animal. As is usual with frogs, the female lays around 30 eggs on the ground and the male fertilizes them. These frogs break custom at this point. The female leaves and the male stays on, diligently watching over his children and waiting for them to hatch. When they do hatch he eats them. "What?" You're probably looking at the screen in confusion right now, waiting for me to explain how cannibal dad is supposed to be a good father. Well, he's such a remarkable father because he doesn't actually eat them. He keeps them in his mouth, his vocal sac actually, until the tiny tadpoles turn into little froglets. Then he opens his mouth and they hop away into the forest. People spend a great deal of time talking about how great bird and mammal parents are, but honestly I find the standard warm blooded animal methods to be somewhat boring. You would be surprised how many different techniques there are out there. Truly, we live in a wonderful world.